Special clearance sales, price promotions, and special offers are all part of the "selling cycle". It is not new. Buyers love and respond enthusiastically to special offers. The problem is that there are many "specials" promoted across the web and through direct mail. One of our suggested approaches to gain some prominence is that you consider a dedicated website. 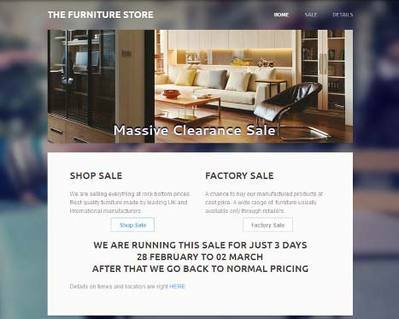 to sell both retail and manufactured furniture. And we do not charge that much to create one with the main features. order online if they were unable to form a decision while in the shop.